By far the best spider man movie yet, this one has got brains, intensity, and the perfectly-cast andrew garfield as the lead. This is just a wonderful movie. it’s dark and awkward and detailed in all the ways a superhero movie should be. there is nothing light or campy about this movie, and while there is humor in it, that humor never gets in the way of the storyline or the action. andrew garfield is cast perfectly here as the new, sensitive spider man. this is a guy who cries. a couple of times. maybe it’s too much, or maybe it’s showing us that he’s still a kid and vulnerable and immature. and all of that is okay. he’s not bruce wayne perfect like christian bale’s batman. this movie works for all sorts of reasons, and a major one is the action and effects. they actually look realistic. by that, i mean, even though you know it’s computer generated action, it doesn’t look like it. the creatures and movement of characters through the air, don’t look like digital drawings, the way that most computer effects do. the dark tone of the movie is right on the money, and while there might be a couple of corny moments every here and there, this one blows the tobey maguire spider man movies to pieces in every way. How did they know andrew garfield was going to be perfect as spider man? He had one movie before this, the social network. how did they know marc webb would be the right director? he also had just one movie under his belt, 500 days of summer. but the people at marvel and sony pictures have made enough superhero movies by now that they know what they’re looking for and they know what works. they were taking a chance with sam raimi, ten years ago, before he directed all three of the previous spider man movies. but raimi was an established director, just a different kind. he was more low budget horror movie than mainstream. and they got him to be mainstream with the spider man movies. as a result, they often felt corny and lame. the second one was good, but it wasn’t great. the first one was just okay. and the last was incredibly lousy. 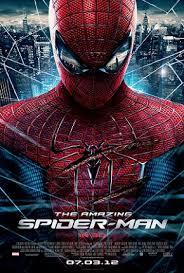 this new reboot, the amazing spider man, is the first one that is actually great! the movie takes the same kind of indie, smart romance energy that webb showed he could handle in 500 days of summer, and brings it to this film. it makes sense if you think about it…romance is the hardest genre to do right. it’s just not a fun genre, and plus it’s not easy to really make a variation on the same story. if you can do it, and do a good job, then you must have talent. webb shows off his skill by making the story of peter parker the guy, and his struggles with being a teenager, into the most interesting parts of the story. we get at least a full hour of this movie before anything spider man is even hinted at, and we don’t mind at all. that’s because everything works in that first hour. andrew garfield charms our pants off as the socially awkward kid who is nice on the inside, but just doesn’t know how to be cool on the outside. tobey maguire tried this in the original spider man films, and he was okay. but he also seemed more arrogant than awkward. i never really bought him as the uncool nerd. and more often than not it seemed like either he, or the movie, was trying to be funny. he would say things like, “oh gosh, yeah.” Andrew garfield talks like a real person. you can’t try to be funny, it just has to come natural. with andrew garfield, everything comes natural. the movie begins with peter parker as a little kid, playing hide and seek with his father, going around the house looking for him. and even this opening scene, which will have nothing to do with the overall plot, is handled with delicacy and details. parker and his father stumble on his study room, which has been broken into, and young peter watches as his father checks a hidden drawer compartment, to reveal a secret notebook. we don’t know what any of this is or what it means, but we are certainly interested. parker’s parents disappear, and we never really find out what happened to them. a plane crash is mentioned at one point, but it is very brief, and seems like a made-up story. i like that this movie doesn’t explain everything. it’s clearly saving things, putting mysteries out there, and setting up the other films that will come in the future. a lot of times it’s annoying when movies do that, because it seems like the film is not telling a complete story, but here it’s the perfect move. that’s because there is just so much else going on. we can’t get answers to everything, and if we did, it would feel like the movie was explaining too much. we get to spend a good amount of time with the adults peter lives with, aunt may and uncle ben. they are played by veteran actors sally field and martin sheen, and they both make these characters feel real. that’s a lot more than i was ever able to say about the sam raimi movies. these aren’t cardboard cut-out characters, and everything isn’t perfect at home. when peter forgets to pick up aunt may at the bus stop one night, there is hell to pay for it, and he and uncle ben go at it with some real confrontation. emma stone is featured here as gwen stacey, parker’s highschool girlfriend, and i am so glad the movie chose her storyline as opposed to doing mary jane watson again. anyone who knows the comics knows that mary jane isn’t the girl who parker meets until well until his spider man days. yes, she’s the girl that parker eventually marries, and she is the iconic girl of the spider man series, but skipping over gwen stacey is skipping over a huge part of the spider man story. this movie makes sure not to make that same mistake. and emma stone is great. she’s just a nice, likable actress, and like garfield, she seems to fit the part naturally, as opposed to kristin dunst in the previous series. dunst too often seemed like she was trying to remember her dialogue more than actually playing a character who was thinking of those lines herself. i don’t love the idea of stacey working at oscorp industries and being the one who shows the interns around (she’s still in high school herself), but everything that happens with her at school is great. stone and garfield have real chemistry together too, and the two costars even started dating in real life, right after the movie. 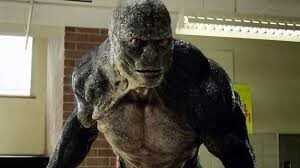 the villain of the movie is the lizard, and he only comes in the second half. the first time we see him, it’s a little silly just because everything in the movie up until this point has been grounded in the real world. but after that one initial first impression, things get better and better for the character. he starts to look pretty cool and he speaks, which is a great move for a man-creature. in all of the original spider man films, as well as most superhero movies these days, the villain is always a human with some power or ability. think of doctor octopus or the green goblin. they dress up in costumes. the lizard is an actual monster. and in the rare occasions where a hero does fight a monster villain, the moster certainly doesn’t talk. by having the lizard talk, it keeps us remembering that he is not a beast, but just a deformed human. he looks cool, like a monster, and then on top of that, he gets to speak too! it’s the best of all worlds here. there’s so much to talk about with this movie. the action looks great. for the first time the visual effects of today have gotten to a point where they don’t look completely fake. spider man has never moved through the air as cool as he does in this movie. and the movie has a lot of fun with that. the 3d version of the film really works! that’s because this movie, like avator, was actually filmed in 3d, as opposed to being converted later, the way most movies are these days. as far as the storyline, yes, it is soon after the original trilogy ended, but so what? this story tries to make variations wherever possible so that we are not seeing the same scenes twice. uncle ben’s death is different here. peter doesn’t fight in a wrestling match. this movie goes more for the heart. it’s not just that uncle ben was killed by a guy that peter didn’t stop, it’s that the whole reason uncle ben was out on the street to begin with is because he was looking for peter. the amazing spider man is a pretty great movie. the action of seeing this giant lizard attack spider man (so cool that they made the lizard huge, instead of regular human size), and the storyline is very well orchestrated. the casting and direction are right on the money, i was extremely impressed with this film. as far as the storyline, i love how much this movie leaves out and sets up for the future. there’s the mystery of the briefcase that peter finds which belonged to his father. there’s the mystery of the connection between peter’s father and curt conners (the lizard). and then there’s also a lot of mention of norman osbourne, who goes unseen in this movie. clearly he will be in the next film and will be played by a star, which is why they didn’t want to cast someone in the role in this movie. the movie is doing tremendous business right now, having already made all of it’s money back with worldwide grosses after only a week in release. and it seems like marc webb will be on board for the sequel. with the christopher nolan batman franchise rapping up this summer, it’s nice to have a worthy superhero franchise to take it’s place.